This card can be used for a variety of occasions and is great for both male or female cards, why not add a personalised sentiment or verse to the tag to make it extra special. 1. Carefully score a piece of pink polka dot paper 12 x 17cm and then using a metal ruler tear the sides, stick down to your card blank that has been turned landscape with the crease at the top. 2. Using the double sided paisley paper cut and tear two 10.5 x 16cm rectangles, glue one to the card base with the blue side facing front. On the green paisley paper score and tear a diagonal line 5cm down on the left, across to the right side. Glue a thin adhesive border around the 3 closed sides to create a pocket and glue down to the card blank. 3. 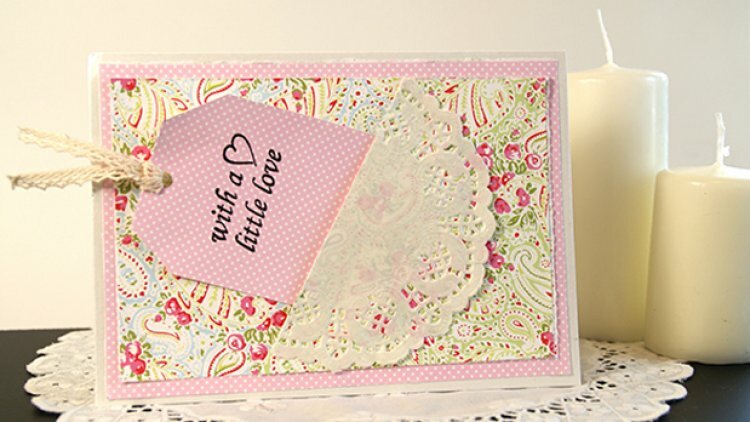 Using the pink polka paper cut a tag shape 11.5 x 7cm, trim the top corners and add a punched hole. Stamp the tag with your sentiment and add a lace string to the punched hole. 4. Cut a doily in half and glue down to the front of the pocket.